200mm Traffic Lights are designed for long life durability and prolonged use with an approximate lifetime of 80,000 hours of constant operation and a UV resistant polycarbonate housing, making this product an ideal choice for any industrial application. 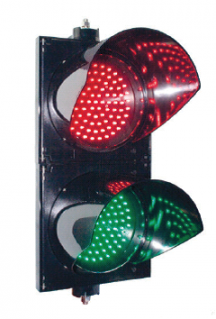 – 200mm LED traffic light modules and housings. – Modules with 31 High output LED’s. – 80,000 hour life (approximate). – Light Source: 6.5mm LED’s. – Light Output: Red >400Cd(e); Green/Yellow >600Cd(e). – Wave Length: Red – 620-630nm; Yellow – 590-594nm; Green – 503-508nm. – 1,2 & 3 aspect housing. – 24VDC and 85-265VAC power supply options. – Meets EN12368, CE, RoHS. – Customized control options available. – Protection Degree: IP65 (modules), IP54 (housing). – Temp Rating: -40 to +80 degrees Celsius. – Cable Entry: Trough housing bracket. – Construction: UV resistant polycarbonate. 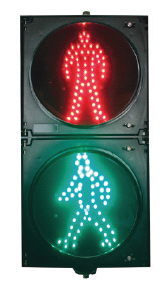 To order non-standard combinations or arrows, crosses, and pedestrian symbols, order the modules and housings separately. Blue, White, bicycle and countdown modules are available on request subject to minimum order quantities. 25JD2003251DCRG 2 aspect Red/Green, 24VDC, 90/90 LED’s, 5.5kg. 25JD2003251ACRG 2 aspect Red/Green, 85-265VAC, 90/90 LED’s, 5.5kg. 25JD2003351DCRGY 3 aspect Red/Yellow/Green, 24VDC, 90/90/90 LED’s, 8.0kg. 25JD2003351ACRGY 3 aspect Red/Yellow/Green, 85-265VAC, 90/90/90, 8.0kg. 25DXJD200552DCR Red LED module, 24VDC, 90 LED’s, 0.75kg. 25DXJD200552DCY Yellow LED module, 24VDC, 90 LED’s, 0.75kg. 25DXJD200552DCG Green LED module, 24VDC, 90 LED’s, 0.75kg. 25DXJD200552ACR Red LED module, 85-265VAC, 90 LED’s, 0.75kg. 25DXJD200552ACY Yellow LED module, 85-265VAC, 90 LED’s, 0.75kg. 25DXJD200552ACG Green LED module, 85-265VAC, 90 LED’s, 0.75kg. 25DXCD200552ADC Red X LED module, 24VDC, 45 LED’s, 0.75kg. 25DXFX200552DCR Red LED module, 24VDC, 36 LED’s, 0.75kg. 25DXFX200552DCY Yellow LED module, 24VDC, 36 LED’s, 0.75kg. 25DXFX200552DCG Green LED module, 24VDC, 36 LED’s, 0.75kg. 25DXFX200552ACR Red LED module, 85-265VAC, 36 LED’s, 0.75kg. 25DXFX200552ACY Yellow LED module, 85-265VAC, 36 LED’s, 0.75kg. 25DXFX200552ACG Green LED module, 85-265VAC, 36 LED’s, 0.75kg. 25DXCD200552DC Red X/Green arrow LED module, 24VDC, 45/36 LED’s, 0.75kg. 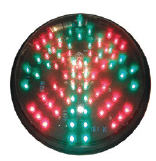 25DXCD200552AC Red X/Green arrow LED module, 85-265VAC, 45/36 LED’s, 0.75kg. 25DXRX200552DCG Static green man module, 24VDC, 96 LED’s, 0.75kg. 25DXRX200552ACG Walking green man module, 85-265VAC, 96 LED’s, 0.75kg. 25DXRX200552DCR Red man module, 24VDC, 66 LED’s, 0.75kg. 25DXRX200552ACR Red man module, 85-265VAC, 66 LED’s, 0.75kg. 25PCH200 1 aspect housing with mounting accessories. 25PCH200X2 2 aspect housing with mounting accessories. 25PCH200X3 3 aspect housing with mounting accessories.